PLEASE NOTE: Due to a number of recent requests from designers, the deadline for the 2018 Mars Society Poster Contest has been extended until Wednesday, April 18th, 5:00 pm MST. The design competition was originally scheduled to end on April 13th. The 2018 Mars Society Poster Contest kicked off recently. 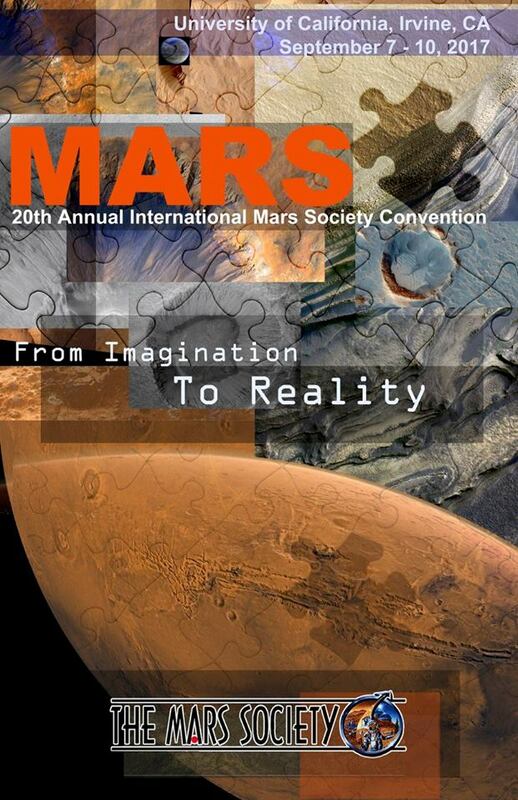 Members and friends alike are invited to submit a poster for consideration, with the winning design to be used as the main promotional graphic for the 21st Annual International Mars Society Convention, scheduled for August 23-26 at the Pasadena Convention Center (Pasadena, California). Those intending to create a poster for the annual competition are asked to incorporate the main theme of this year’s international convention - “Mars & The Space Revolution” - into their planned layout. The deadline for submitting a poster design is Friday, April 13th (5:00 pm MST). Standard technical requirements for the contest are as follows: 1) The poster size should be 11" x 17", 2) There are no restrictions with regard to use of color, 3) If your poster is selected, the designer will need to submit a full color poster as well as a gray-scale version, and 4) Poster designs can be submitted in Photoshop or as a .pdf file (although the former is preferred). All poster submissions should be sent by email to: postercontest@marssociety.org. Also please use this email address for any questions related to the contest or the submission process. The winning design will be announced during the week of April 23rd. Thank you for your involvement and good luck! Use of Image: Artist gives permission to The Mars Society to use digital images(s) of art work in online and print media. Poster Contest Disclaimer: The Poster Contest Artist, by submitting an application, agrees to defend, indemnify and hold harmless The Mars Society from and against any and all claims, demands or expenses (including attorney’s fees) for libel, slander, invasion of privacy, infringement of copyright, personal injury, damages, or any other claims, demand or expenses resulting from performance in connection with this agreement.